Map It! Okinawa: "Legend of Yara Muruchi - Kadena"
"Legend of Yara Muruchi - Kadena"
“The Muruchi legend reveals that in the era of King Gihon (13th Century), there was a giant serpent inhabiting an old marsh known as Moroki (Muruchi)...The serpent created strong heavy winds and brought calamity to the villagers. To quell the calamity, the villagers offered young girls as sacrifices. One year, a very dutiful and obedient girl was chosen as a human offering. The girl was distressed with the thought of leaving her dear old mother behind, yet decided to become sacrificed in order to save the residents of neighboring villages. However, during the ritual of sacrifice, a heavenly deity appeared and slew the giant serpent. 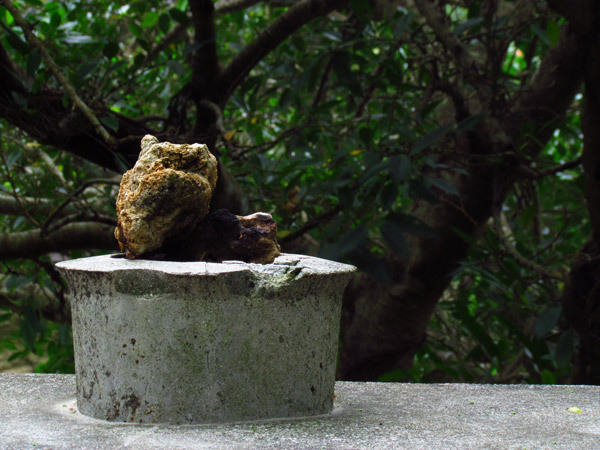 As you walk down the cement path you will see an alter-like structure facing the marsh, and on top is a mysterious centerpiece (stone cup-like holder) in the middle. This is one for the O-files and is not 100% certain if there is symbolism related to the legend and this structure. Kumiodori (Traditional Okinawan Opera). Acccording to the Kadena Board of Education this legend formed the basis for 'Koko no Maki', one of Chokun Tamagusuku's five most popular traditional theater performances, better known as Kumiodori. Chokun Tamagusuku is considered the 'Father of Kumiodori' and first debuted this Okinawan opera-like performance in 1719(2). Kumiodori is listed as one of the Intangible Cultural Properties of Humanity under The United Nations UNESCO program(3). King Gihon. A very mysterious figure from the Old Ryukyu Kingdom is King Gihon. For some reason after eleven years of rule, he left his throne, handing power over to King Eiso(4). 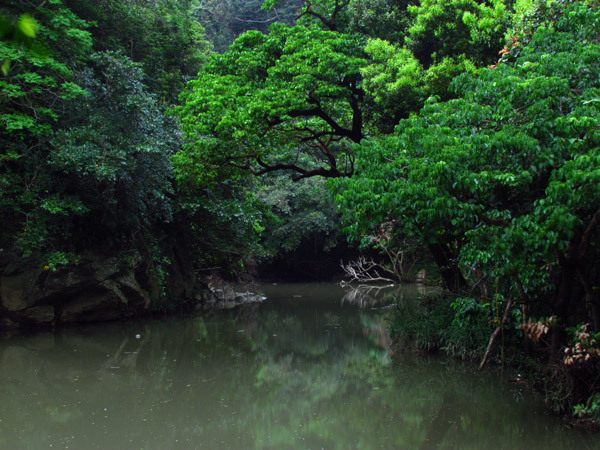 It is believed he fled to the north, and his final resting place said to be in Hedo of Kunigami Village(5)(6) (location to revealed at an appropriate time). So why flee to Hedo? The book, Visions of Ryukyu, hints that the King may have stood down possibly because he himself believed the heavens were not pleased with his rule. It is said that during King Gihon's tenure there was great famine and disease, and in the days of the Old Ryukyu Kingdom, this might have been interpreted as a sign of displeasure from the gods(4)...and out of shame, King Gihon fled to parts unknown(6). 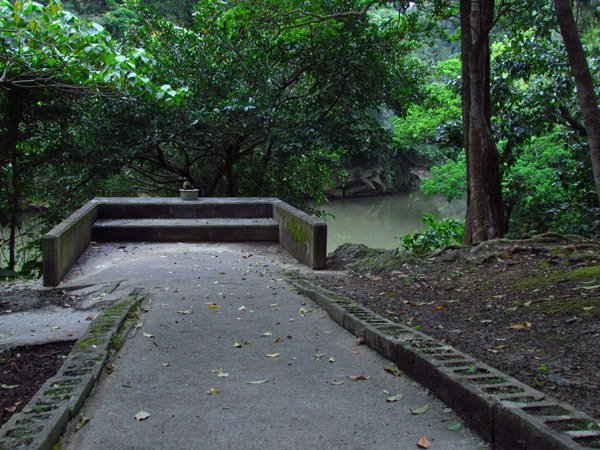 Kitanakagusuku Village is also said to be another possible location of his final resting place(6) (location uncertain by the author). 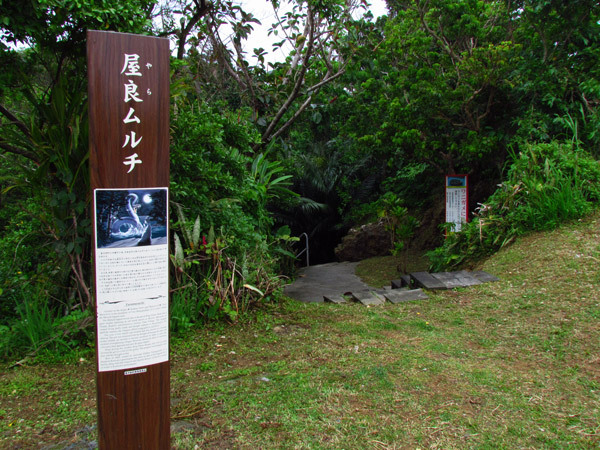 On February 20th 2013, the Kunigami Board of Education opened the tomb in Hedo for the first time to the public in an effort to use science and technology to determine the possible age of the remains. This post will be updated upon the Board's findings and results. Author's Speculation. Given the distance of Yara and and King Gihon's throne (Tamagusuku region? ), it is a wonder how King Gihon got wind of the story at Yara Muruchi in the first place. And since his rule was plagued with great misfortune, his involvement with Yara Muruchi simply could have been a desperate attempt to revive his kingdom with any good news he could possibly find, especially if the story involved an intervention from the heavens. There are no references or facts to support this theory. However, such political tactics have been used throughout history using stories of heroism to lift the morale of a nation. Other legends have it that King Gihon desperately offered himself as a sacrifice to the gods in order to bring rain to a much needed kingdom. And as legend would have it, heaven seemingly intervened once again, sparing King Gihon's life from being burned at the pyre as rain (just at the right moment) smothered the burning flames (6). Source of information. 1) Legend of Yara Muruchi, Kadena Board of Education (sign in Japanese and in English) on location, 2) Kumiodori /Chokun Tamagusku, Okinawa Prefectural Board of Education website, 3) Kumiodori UNESCO Status, unesco.org wesbite, 4) Visions of Ryukyu, 1999 Gregory Smits, pg 61, 5) Okinawa: People and Their Gods, 1969, James C. Robison, pgs 31,62, 6) Ryukyu Shimpo Online English Edition February 21, 2013. Epilogue. 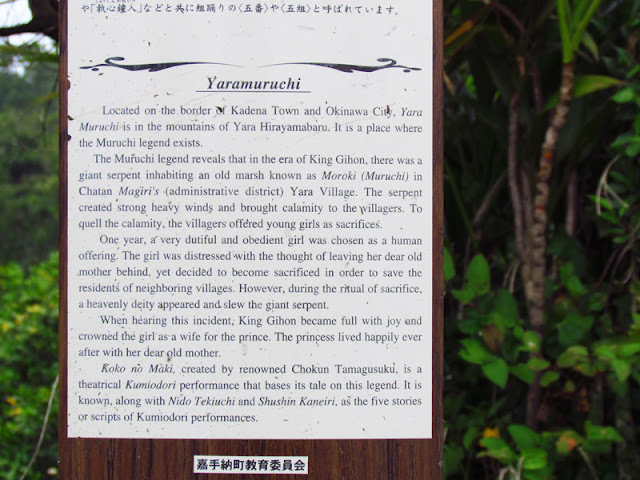 King Gihon's burial tomb is a known historical location, however its location will not be listed on this website until all research and excavation has been completed by the Kunigami Board of Education. Caution. 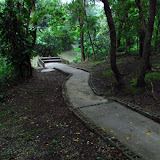 The area, especially on the rocks near the marsh, is very slippery. Use extreme caution when walking on the entire premises to include the stairs. 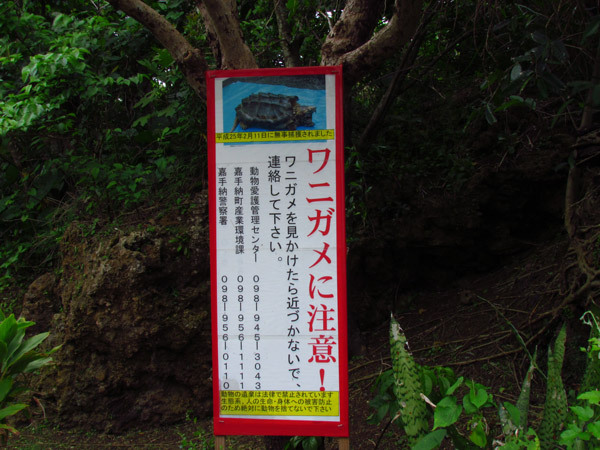 You will also see a sign in Japanese about the Alligator Snapping Turtle (wanigame, ワニガメ). This is a warning not to touch and if found please call the Japanese Animal Welfare Society at 098-945-3043 or the Kadena Town Office at 098-956-1111. Directions/Parking. 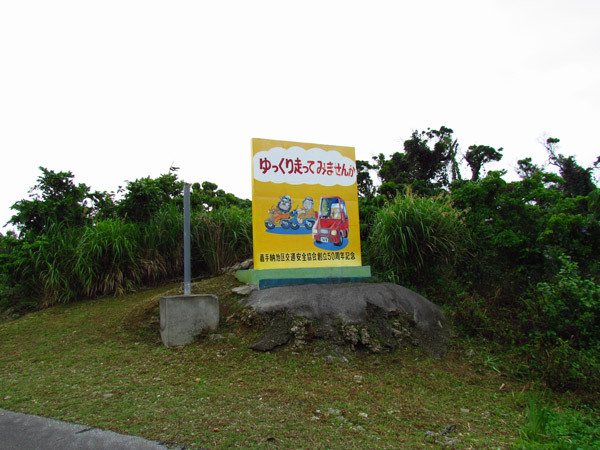 The Yara Muruchi location is located along Highway 74 in Kadena. Only the east bound traffic lane has access to the Muruchi entrance area. Look for this explanation sign at the entrance location. Past this on the eastbound lane you will see this LandMark (a road safety sign). Further to the east of this LandMark is a driveway where you can pull in and park (Green Thumbtack in the map). The driveway will be chained off but there is enough room to park your car safely off to the side. Please do not block the driveway since farmers still use this road to access their farms. Due to the high volume of traffic along Highway 74, it is not recommended you park your car along the side of the main highway. Good stuff, always requires further investigation, Yeah ! "A Nameless Waterfall, Kunigami Village"